Hachiko: The dog who continued to wait for his owner for more than nine years after his death. One of the greatest joys of having a dog is the moment when, after a long trip or a hard day at work, you come home, open the door, and find yourself greeted by big sparkling eyes, a wagging tail, and happiness, welcoming you like you are the only person alive. In that moment, no matter how hard life might be, you know you are loved by someone like there is no tomorrow. Furthermore, this goes on day after day, never getting old, at least not for them as they wait on the other side of the door, for in their eyes, you are their best friend. Albeit, there are countless stories in life, literature, and in the movies showcasing that there are no friends like these friends, none can compare to one dog’s love, whose story of loyalty is as heartwarming and heartbreaking like no other. So when wondering why dogs are seen as man’s best friend, this dog’s sad and lovable story just might stand as a testament to why. This is the story of Hachikō, the lovable Akita, who every day for nine years until his death, sat in the same place, at the same time, waiting for his dear friend to come home, not knowing he had died unexpectedly at work and would never return. Hidesaburo Ueno, a professor at Tokyo University specializing in agricultural science, in 1924 set on a course to find a loyal companion for himself to relieve his loneliness and so looked for a puppy. He didn’t want just any puppy: he wanted an intelligent, independent, and fearless dog, and these were the distinguishable qualities of a purebred Akita, deemed in Japan as Guardian of the Emperor. The professor searched for a long time in order to find a perfect Akita puppy as they were extremely rare. To help him, one of his students, Hirokichi Saito, did thorough research and found only 30 pure bred Akitas remaining in Japan. Saito, from the 30 located, encouraged his professor to adopt the one he found in Odate, a city in the Akita prefecture. 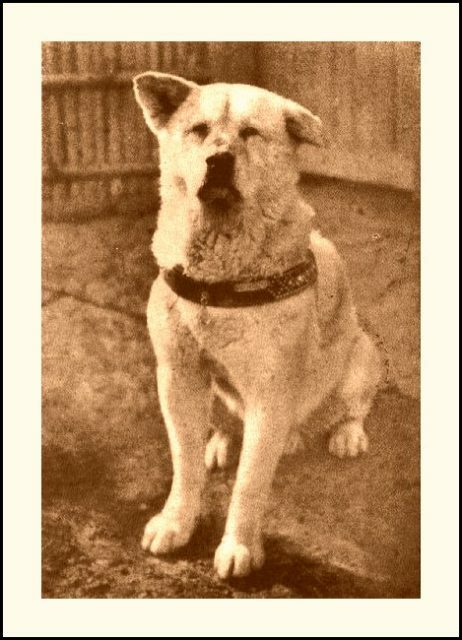 As advised, he chose this dog and named him Hachikō, or Hachi, which later grew to be his nickname. Very soon, they became inseparable. Hidesaburo, who never fathered any children, loved this dog, and Hachikō came to be his constant companion. Their friendship grew so much, that every morning Hachikō would accompany Hidesaburo on his long walk towards the Shibuya Train Station, in central Tokyo, when his friend was on his way to work, and come back to the station in the afternoons to greet him and pick him up on his way back. This custom of theirs went on for almost two years, until May 21, 1925, when Hachikō, as usual, sat at the exit at Shibuya train station waiting for his master to appear, only to find the train arrive this time without his Hidesaburo on it. His friend never showed up. In the middle of a lecture at the university, Hidesaburo died suddenly from a cerebral hemorrhage. After that, Hidesaburo’s widowed wife, unable to provide adequate care, gave him to a former gardener of theirs, where Hachikō would enjoy a new home loved by a new family. 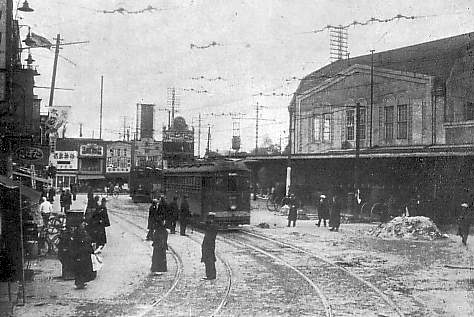 However, what nobody expected was that throughout his remaining 10 years, Hachikō would continue to go to the train station every morning and afternoon, precisely at the same place and same time when the train was about to enter the station, waiting in vain for his beloved friend to return, which of course never happened. The first years were not easy for Hachiko. Days passed, then months and years, and station workers, assuming he was a stray dog and afraid for other people’s safety, were always trying to chase him away. Yet he continued coming, despite everything. Then one morning in 1932, a journalist and Hidesaburo’s former student, after seeing the dog every single day at the station when he was boarding the train for work, and again greeted by the sight of the dog waiting when coming back, decided to follow the sad dog to his home. There he met with the gardener Kuzaboro Kobayashi, Hachikō’s new master, and learned of his story of loyalty, and so he began to write articles about him in a major Japanese newspaper. Very soon, Hachikō became a real inspiration for everyone. Celebrities all over the country learned of him. People came to the station to witness the unbelievable story first hand. 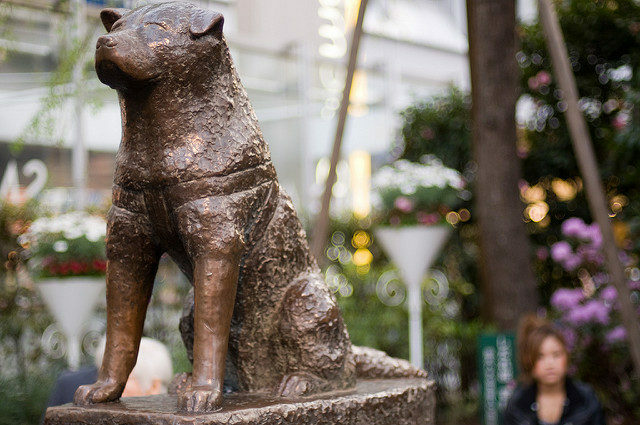 Hachikō came to be known among everyone as “Chuken-Hachikō”, meaning “Hachikō – the faithful dog.” In 1934, they even built Hachikō a statue in front of Shibuya train station, with Hachikō himself present as the main guest at the grand unveiling. 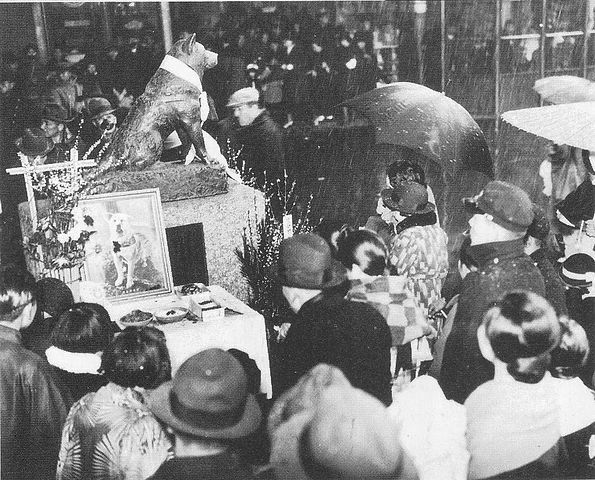 Unfortunately, a year later, on March 8, 1935, Hachikō passed away at the station, still waiting for his friend to arrive. He had terminal cancer. He was buried right beside his master at the Aoyama Cemetery in Tokyo. 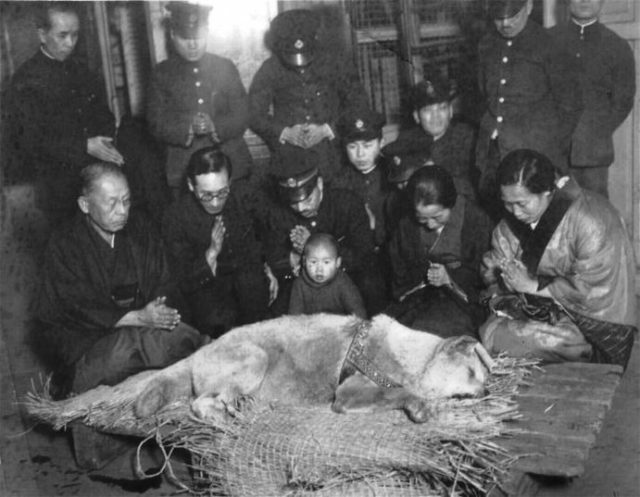 He died, but his story, the story of Hachikō, the dog that never gave up, earned worldwide attention. Throughout the years, inspired by his unbelievable determination, many people wrote books about Hachikō and his tale of love, and in 2009, director Lasse Hallström shot a movie called Hachi: A Dog’s Tale, starring Richard Gere and Joan Allen. 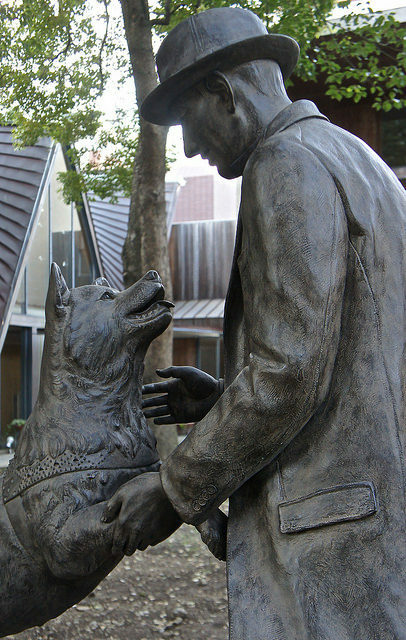 To commemorate 90 years of his passing, the University of Tokyo, where Hidesaburo Ueno gave his lectures and died, built a bronze statue of Mr. Ueno and his dog friend. The statue stands just outside the main entrance near Todai-Mae, representing their long awaited reunion, and a happy one, with Ueno’s cheerful smile and Hachikō ‘s sparkling eyes. 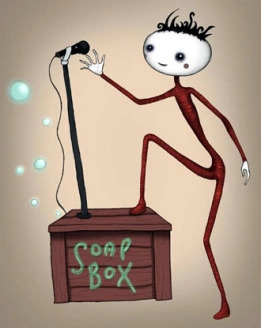 On My Soapbox….How’s it going, Governor Northam? We have all suffered some bad days in our life. Bad days are bad enough, but bad weeks are terrible. The Democrat Governor from Virginia, Ralph Northam, had a less than celebratory week. It started when Democrats tried to push a bill that would’ve permitted abortions up until the moment of birth. The ghastly bill was rejected. Northam, a medical doctor, participated in a radio interview in which he detailed how the bill would have permitted the murder of babies. This placed the Democrats’ abortion extremism on full display. 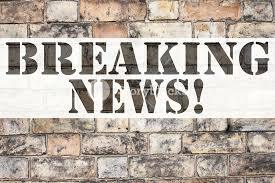 He responded to the blow back by saying he does not regret his remarks about the legislation. Typical Democrat reaction….”Why didn’t Ed Gillespie and the GOP find and expose this photo during the 2017 gubernatorial election?” It would be expecting too much to think they may have asked…”Why were you wearing this hideous racist costume, Governor Northam?” Some of the Democrats do agree that Governor Northam “needs to go, but just not right now.” You are kidding me, right? The next step by CNN, the facts first network, decided to just label Democrat Ralph Northam as a Republican in a video the governor’s office issued. No thanks, CNN. Republicans are finally rid of Jeff Flake and are not seeking a replacement. Wow! What an awful week for Governor Northam. The Editor: Is this like Hints From Heloise, LL ? Fragrant Cat: These are tips that can improve our loyal reader’s lives and save them money. Send them to your Senators and Representatives. Fancy Nancy needs to get some medical advice/attention. TE: Your article is boring, could you spice it up, FC ? If you want some drama push this button. Nancy has lost the love. She doesn’t realize that of all elected and appointed federal employees Representatives are the lowest bottom feeders of them all.